This one is for Wayne who has a real soft-spot for sun-dried tomatoes. He says to me - they are to tomatoes what espresso is to coffee. 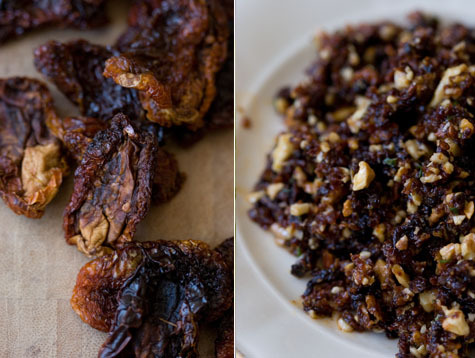 No doubt, there are many things to like about sun-dried tomatoes. I too appreciate their intensity of flavor. And I love their pretty-ugliness - all those blackened wrinkles and that rusted-red patina. Every time I cook with these little tongues of flavor I scold myself for not using them more often - this time in particular. I made a walnut-studded red pesto sauce by casting sun-dried tomatoes in the role basil typically plays. I tossed the pesto with goat cheese raviolis and and served them on a bed of baby spinach. I happened to have some left-over oven-roasted tomatoes on hand, and grabbed for those as well. Their sweetness played off the goat cheese, spinach, and pesto so nicely, but you can certainly leave that component out if you're trying to pull things together quickly, and don't want to bother heating the oven. The key to a recipe like this is sourcing good tomatoes. Not all sun-dried tomatoes are created equally. I regularly come across bags full of dried tomatoes that are more like crisps than anything else. No good - pass on those. Look for slightly plump, pliable, chewy, sun-dried tomatoes. They are far easier to work with and taste better. You can serve this warm or at room temperature. The spinach ends up wilting a bit under the hot raviolis - just what you want. Sometimes sun-dried tomatoes have hard parts near stem - trim those. 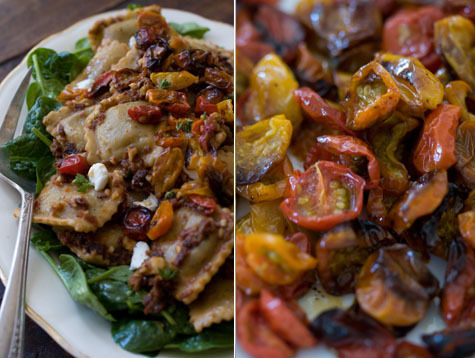 I used goat cheese raviolis here - goat cheese and sun-dried tomatoes are a classic pairing, but I imaging you could substitute any number of other stuffed or un-stuffed pasta. Vegans, try this with penne, and skip the cheese - the pesto will get caught in the middle of all the tubes and be delicious. Lastly, fresh raviolis seem to be sold by the pound or in 12-ounce containers - because you are saucing 'to taste' either will work. 3 handfuls of baby spinach tossed with a glug of olive oil and a big pinch of salt. Bring a large pot of water to a boil. Salt generously and cook the raviolis per package instructions. Drain, but reserve about one cup of the hot pasta water (important!). In the meantime, make the sun-dried tomato pesto by pulsing the sun-dried tomatoes, garlic, pepper flakes, olive oil, thyme, and salt in a food processor until it comes together into a textured crumble. Add the walnuts, and pulse a few more times - see photo. Set aside. Combine 1/2 cup of the reserved pasta water in a large mixing bowl along with two-thirds of the sun-dried tomato pesto. Add the cooked raviolis and gently toss. Add more of the hot pasta water if needed to thin the pesto out - it should make a nice chunky sauce. Taste and add more of the pesto if you like - it's really a matter of personal preference at this point. Arrange the baby spinach on a large platter and top with everything from the ravioli mixing bowl. Top with the cherry tomatoes and a bit of crumbled goat cheese. *To oven-roast cherry tomatoes: Heat oven to 350F degrees. Cut each tomato in half and arrange in a large oven-proof baking dish. Mix together a big splash of olive oil, a spoonful of brown sugar, and a few pinches of salt. Pour this over the tomatoes. Gently toss them a bit, making sure they all get coated. Arrange tomatoes cut-side up. Place in the oven and bake for 45 mintutes or so, until the tomatoes are shrunken and sweet. A one-skillet quinoa recipe - quinoa, corn, chopped kale and pan-toasted tofu tossed with a big dollop of pesto and finished off with a few roasted cherry tomatoes. A vegetarian TLT sandwich inspired by the classic BLT sandwich. This version includes chipotle-marinated tempeh alongside oven-roasted cherry tomatoes, a bit of shredded lettuce, and a generous avocado slather on a thin slice (or two) of great bread.